Following an uncharacteristic quiet spell after the general election, Lt. Gov. Dan Patrick appears to be back in form, back in the news and in the middle of the state’s political conversations. 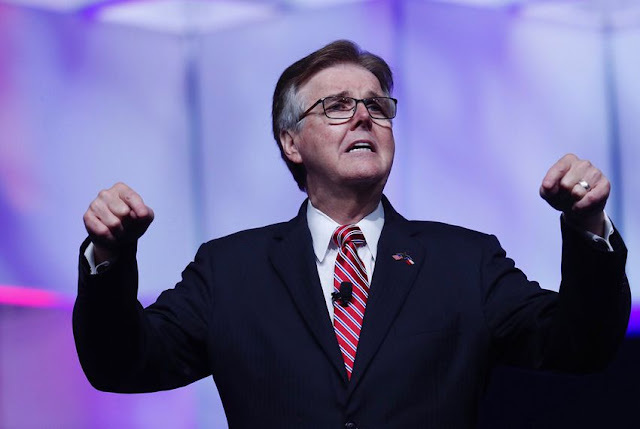 But with new leadership in the Texas House and a governor who appears ready to spend some political capital on a couple of big issues, Patrick might not be the agenda-setter he was two years ago. Newly elected House Speaker Dennis Bonnen, R-Angleton, replaces Joe Straus, the San Antonio Republican who had become Patrick’s foil. Gov. Greg Abbott — helped by legislative studies that have been in the works since the last session — has been trying to build momentum for school finance and property tax remedies, hoping to rebalance formula funding for schools and students while either cutting property taxes or at least curbing the growth of those unpopular levies. Everything else starts as the third or fourth item on the state government’s to-do list. Bonnen’s ascendancy has been the focus of attention for weeks. Patrick’s place in all of this has received less attention. The lieutenant governor was busy, busy, busy before the 2017 legislative session, ginning up interest in what became known as the bathroom bill and 30 priority bills he wanted the Senate to tackle. He came into that session as an overwhelming political force in the Texas GOP and, because of that, in full control of the state’s Republican Senate, relegating the 31 members of that august body to secondary roles. To many politicians inside and outside the Senate, messing with Patrick was dangerous because of his close identification with the GOP’s most fervent voters. His command of the Senate during the last two terms is a trick the late Bob Bullock, a legendary political force who ended his public career as lieutenant governor, never quite pulled off. But now, that Republican Senate majority is skinny; a defection of just one GOP senator could keep a partisan issue from coming to the floor. And the lieutenant governor, who won re-election by five percentage points in November, entered the 86th legislative session without the broad and ambitious agenda he brought in after an almost 20-percentage-point win in the 2014 election. This year, he wasn’t even in the presiding officer’s chair on the session’s opening day; he was in Washington, D.C., meeting with White House staff about President Donald Trump’s push for extending existing walls and fencing between the U.S. and Mexico. But Patrick was back the next morning for breakfast with the governor and the new speaker, a photo op with the governor’s dogs and a quick band-of-brothers news conference on the lawn of the Governor’s Mansion. And as you’d expect from someone who had a long career of his own in the media, Patrick made news. One man’s win is another man’s loss: That legislation never passed, but he seems satisfied that the debate alone solved the problem — an implicit agreement that the state didn’t need a law after all. Patrick’s visit to Washington sparked a rumor that he might be in line for a post in the Trump administration — a rumor that prompted speculation about how the legislative session would go with the senators choosing his replacement from among their own ranks. That hasn’t happened since George W. Bush became president and then-Lt. Gov. Rick Perry succeeded him as governor. Senators made Bill Ratliff the lieutenant governor until the next election. Scratch all of that, but it’s worth noting that it and his absence from the first-day proceedings was the main Dan Patrick news at the beginning of the session. In appearances after that news conference, Patrick batted aside the rumors of federal appointments, dismissed reporter questions about the bathroom bill, and said he is ready to work on school finance, on property taxes and on getting pay raises for Texas teachers (he’s already listing his #3, if you’re keeping score). And he made news again, by telling the president — who was in McAllen to talk about immigration — that the federal government should give Texas the money and let the state build sections of a wall between the U.S. and Mexico. “I thought that was not the worst idea I’ve ever heard,” Trump said. It’s a different table setting this time. The three top officials start without the rancor that had developed between Abbott, Patrick and Straus. The Abbott-Patrick alliance that had developed isn’t the only relationship that counts any more. Abbott and Bonnen seem to get along well. Abbott was the clear top performer on the Republican ticket in 2018. And the list of things to do isn’t coming out of the East Wing — the Senate wing — of the Capitol this time.